Remember back in October when I told how I literally jumped up and down because of The Hot Air Balloon Festival? That was by far my favorite activity in Albuquerque but there were some more things we did as well. 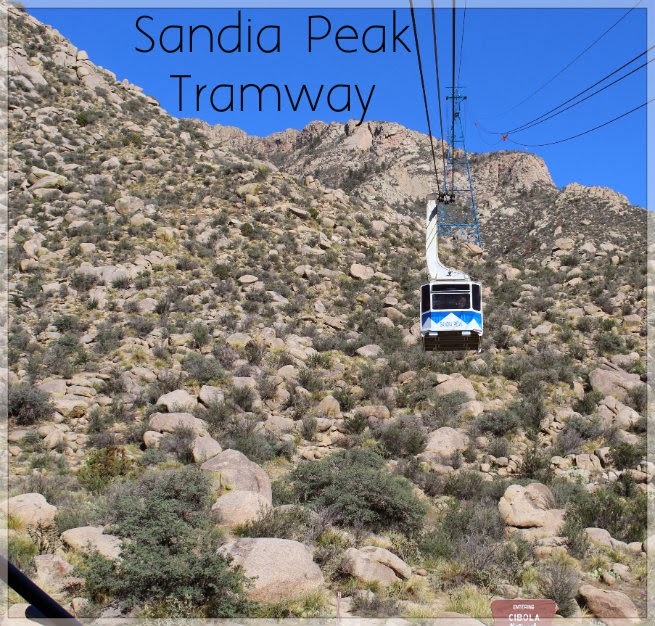 The other big event we did was taking a ride on the Sandia Peak Tramway. 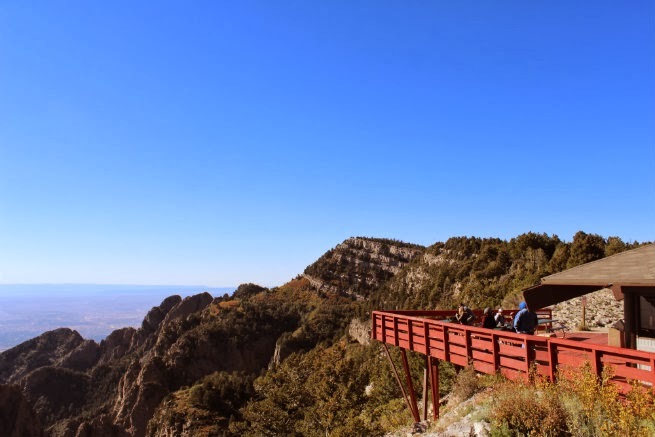 The Sandia Peak Tramway is the longest tramway in the world. 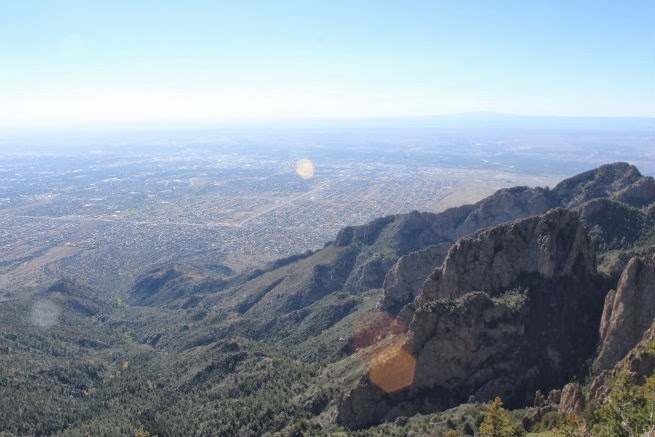 It takes passengers 4,000 feet into the Sandia Mountains in about 15 minutes. The cars can fit 50 people up to 10,000 lb. (Do 50 people weigh 10,000lb? I have no clue). Anyways, that's a lot of people and it reminded me a bit of Asia being crammed in there with everyone. Honestly, I didn't take tons of pictures on the way up. Sometimes things are just too pretty and I made myself set my camera down and soak it all in. The train carries you up at about 13 mph which gives you enough time to see all the beauty. The guide tells you different kinds of stories including a plane crash that happened there (before the tramway). The views up top are phenomenal. They say you can see up to 100 miles out. This next picture was taken from the top. 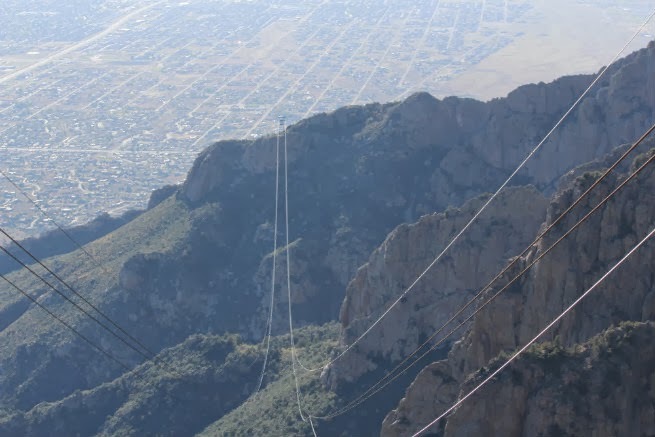 The cables you see is the first leg of the journey going down. If you look closely you can see a little building that the cables and tram go over and that takes you down the second part of the mountain. 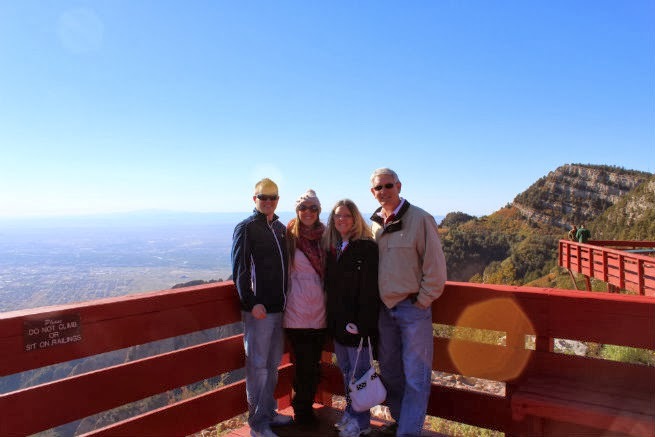 I loved going up the Sandia Mountains but I loved it more because I got to experience that with my husband and parents. It was also neat to see my Dad in this area as Albuquerque is his home town and he has fond memories from this place. Lastly, I'd like to talk about something that is super duper crazy delicious - Hatch Green Chilis. I can't believe I haven't told you all about them because 1. they are just so tasty and 2. I'm crazy about them. Anyone else out there love spicy food? My Dad, being from ABQ, introduced me to them. I never really cared for the 'spicy' hatch green chilis until I moved to Korea and I grew a love for 'everything has to be spicy'. Hatch green chilis are local to New Mexico and have a unique flavor. Be advised though - they can be super spicy and addictive. However, the spice comes with a unique flavor. New Mexicans are serious about their chilis too. When I was visiting I read an article saying how they are spelled chili. Not chile or chilies but chili. Well, excuse me New Mexico! I also saw a long line of people standing outside a grocery store and thought 'What the Heck are all those people doing?' and then I realized there were fresh green chilis being roasted and they wanted to grab 'em before they were gone. Here is what the Huffington Post had to say about them. Hatch Green Chilis are in season mainly in September and guess what guys? My little town of Woodward had them. I bought me a massive amount of those, roasted them in my oven, peeled them and put them in just about every dish. I think Dave had his fill of green chilis but I'd eat them every day if I could. In New Mexico they have a green chili 'gravy' that they slather on just about everything you can think of and holy guacamole it's so good! Many grocery stores now carry canned Hatch green chilis. You should buy some! Now that I've written about green chilis I'm gonna have to eat some! nom nom. How about you? Do you like spicy food? Do you hate it? Would you ride the tramway? Longest tramway in the world? I'd try that! I already tried the world's longest outdoor escalator (Hongkong).